The '8th Gaon Chart Music Awards' finally announced their line up. The '8th Gaon Chart Music Award' is one of the awards awaited by South Korean music lovers. Gaon Chart is a South Korean national chart that has the same position as Oricon Japan and Billboard USA. 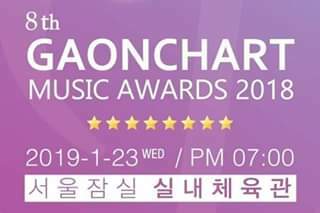 '8th Gaon Chart Music Awards' will be held January 23, 2018 at Jamsil Stadium.